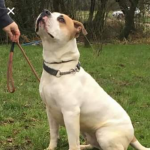 We are hoping you’ll help us help Milo find the home he deserves. 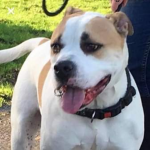 He’s a very handsome 3 year old American Bulldog cross, he has a fantastic nature, loves everyone he meets and is good with other dogs. Milo is not cat tested. 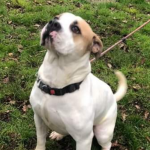 Milo is super strong on the lead and is built like a bull so we would prefer to home him with older children due to his size and strength. He does love children though but would probably mow them down and then give them a good wash!! 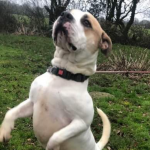 Milo loves to play and would benefit from an active family home. 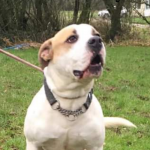 Milo is neutered and chipped and is ready to find his forever family. 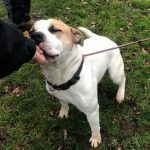 He’s in kennels at the moment in Carmarthen with West Wales Poundies where we are sponsoring his place and it would be best if he could have a home local or thereabouts please to enable follow up checks to be done, thanks x Wales, he needs you!